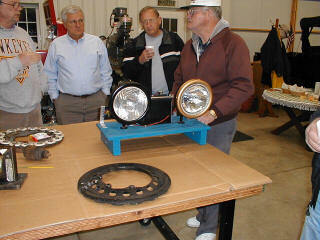 The April meeting was held at Jack Putnam's garage near Bluffton. Bob Torbet led the meeting with 13 members in attendance and 2 guests. The club was presented a check for $500 from the Ford Motor Company for the upcoming 14th Annual Ohio Model T Jamboree. Bill Mack is pursuing a further donation for the Saturday tour. Bob Hollister is still working on the club's non-profit Corporation status. Melvin Gierhart presented his materials to the group about the Ohio Jamboree and asked for any further information from the other members. A lot of donations have been coming in from the Model T suppliers. We are continuing to seek donations to keep the price of this tour low while still maintaining a high level of satisfaction to the attendees. There was a discussion on insurance for old cars and where to find the best prices. We also were treated to a hands on discussion about setting the flywheel in the correct location to charge the magnets in the car. Mel gave a demonstration of his sealed beam headlights for the Model T. Bob brought along his hand-wrapped magneto with supplies to try it yourself. And, Dave brought a growler to perplex the crowd. 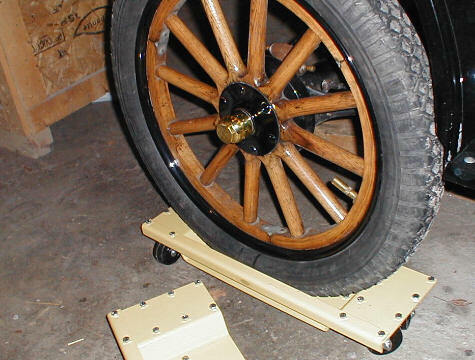 With all of the discussion recently about charging magnets in and out of the car, the question came up during the April meeting about setting the magnets in the correct location. Jack wheeled out an engine with the hogshead off to experiment with determining which magnets were where on the flywheel. This information is needed to charge the magnets in the car. Dave tries to determine which magnets are under the magneto post with the iron hogshead in place. Jack demonstrates how the south poles of the magnets attract the north pole of the compass. This is the magneto coil ring that is used to charge flywheel mounted magnets. The poles of the magnets are also marked with paint. Errors may reverse the poles of the magnets. Don't try to reverse them. Iron wants to remain in its original configuration. Replacement magnets as received from Ford. and the low band adjustment bolt hole. 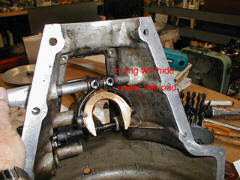 The last hole does not generally leak because of the tightness against the threads. 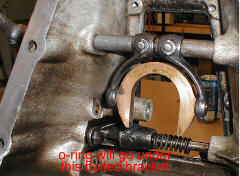 All of the other shafts can be taken care of with o-rings. metal change from place to place on the housing. 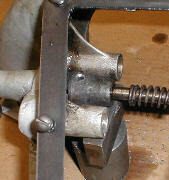 To help keep pressure off of the casting, back up all work with steel spacers or anvils. 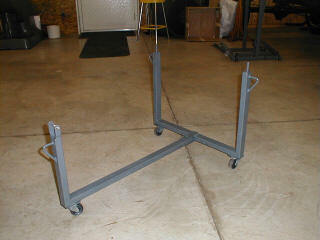 The metal will absorb the striking and prying and spare the soft aluminum. under the shaft to relieve the stress on the aluminum pads that are cast into the housing. These pre-cast pads were set into the inside core while casting the hogshead. The molten aluminum would hit the pre-cast pads and weld itself into one solid piece of aluminum. The process created localized embrittlement of the metal and a propensity for cracks. I can't guess how they normalized the metal on such a grand scale in the early 20th century. Once the pins are removed and the clutch fork assembly broken free, the clutch arm shaft is placed in a lathe and the nothces are machined. Since all hogsheads are worn to a varying degree, the amount taken off of the shaft is custom fit every time. Its best to go a little at a time and start with the right end of the shaft first. 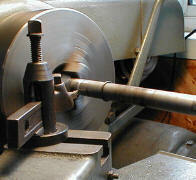 Once the right end is set and offers a bit of resistance, the left end can be machined and checked in a similar fashion. 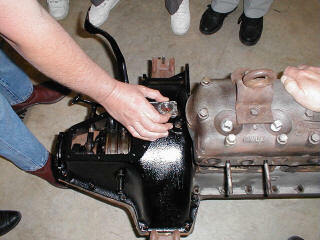 easy ones are the brake and reverse shafts. 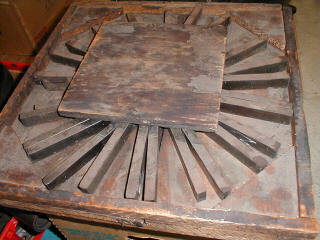 These shafts are held in place by a bolted plate on the outside of the hogshead. As long as the plates haven't been ground down, there should be clearance for an o-ring between the plate and the aluminum housing. 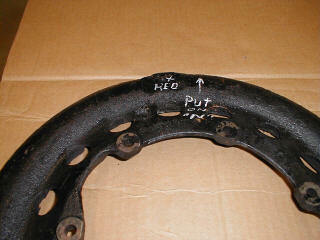 If the back of the plate is flat, a groove can be ground in the plate without altering the pedal shaft at all. pedal includes the removal of the low pedal cam that is held tightly to the pedal shaft by years of oil crud and another pesky pin. We had a hard time getting this casting off of the pedal shaft. 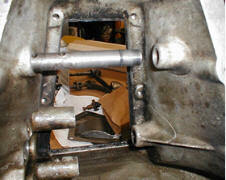 the cam was heated and cooled many times to get it to let loose of the shaft. Once the shaft is removed, the o-ring is fitted the same as the other pedals. The only difference is that the work is all done from the inside of the hogshead instead of the outside. What Does a Growler Tell Us? Dave Nolting brought in a couple of armatures that he wanted to check with a growler. Some of us remembered that it involved a hacksaw blade and some remembered that it jumped under certain circumstances. No one was sure exactly how to interpret the results. The answer came the following day after posting the question on the MTFCI forum. Follow the link to Frank Iaccino's instructions. Ron Patterson's response is quoted here. Each generator armature winding is connected in such a way to be open circuit. That is to say the winding is insulated from all other windings and the ends are connected to adjacent segments of the commutator which are separated by the Mica insulation between copper commutator segments. If any two of the commutator segments are shorted together (more on this later) or any of the windings have inter or intra windings shorts there will be a closed loop electrical circuit. The growler places a very strong magnetic field in the armature windings. As you know when a magnetic field is placed in a closed loop of wire around an iron core an electromagnetic is created. Because they are normally open circuits the section of the armature laminations where the winding is wrapped around will not become an electromagnet. On the other hand if there is a short between adjacent or non adjacent commutator segments or an inter or intra winding short in one of the windings the strong magnetic field will cause current to flow in the shorted loop of the winding magnetizing the section of the laminated armature the winding is wrapped around. So when there is a short in the windings the armature becomes and electromagnet and the hacksaw blade vibrates. Three additional points need to be made. The hacksaw blade should be parallel to the armature laminations 180 degrees from the growlers strong magnetic field and the armature rotated to check for winding shorts. i.e. If you get the blade too near the growler electromagnet creating the magnetic field the blade will vibrate. 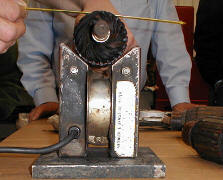 The armature should also be checked with an ohm meter for shorts between the commutator and the armature shaft. Infinite resistance is the reading you should obtain. The growler test will not detect this type of short. 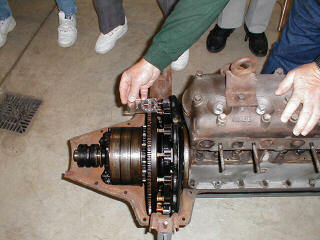 Back to inter commutator segment shorts. These may not be visible. There may be a carbon track short inside the commutator you may not be able to see. The commutator is removed during rebuilding process and a high voltage breakdown test is made to fine these. Most of the arrangements have been made and the information for this year's Jamboree is slated to be in the mail by May 15th. This should give poeple plenty of time to make arrangements for the Labor Day weekend. The tours are mapped out with Saturday going to Grand Rapids and Sunday going to New Bremen. Planned stops will be Tildon Farms, Bicycle Museum, Railroad Museum, and Old Car and Truck Viewings along the way. We plan to keep the prices low: so, anyone will be able to enjoy this annual event.